With iOS 10, Apple opened Siri to third-party developers with a public API, allowing the personal assistant to summon third-party services and apps hands-free. 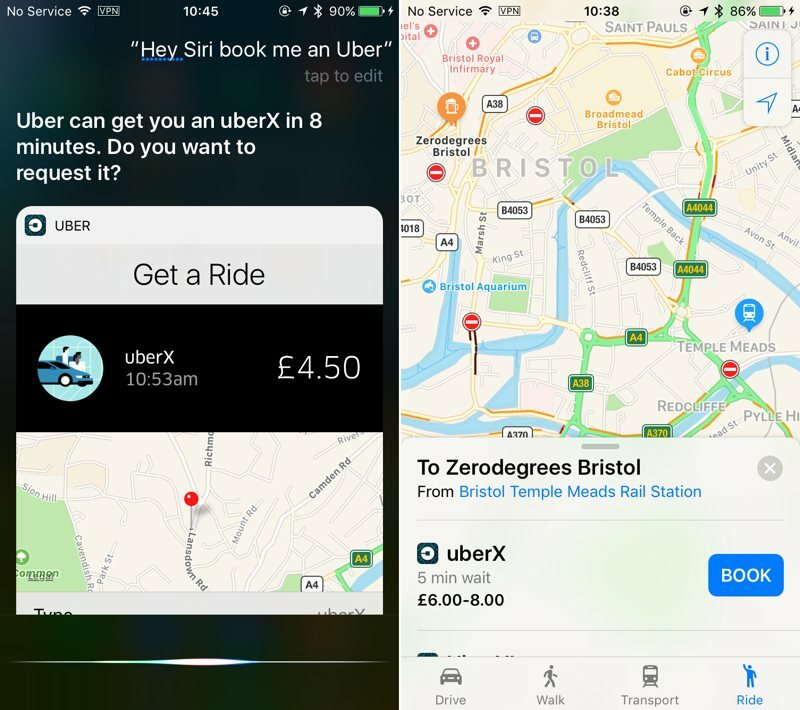 Two of the first apps to make use of the new Siri SDK are WhatsApp Messenger and ride-hailing app Uber, both of which issued updates for their flagship apps this week. Uber users can now hail a ride with a "Hey, Siri" command, followed by "Book me an Uber" or other variants. Apple has also allowed the ride-hailing service to be integrated into Apple Maps under a new Ride tab, where users can choose from a list of available drivers in the area. As pointed out by MacRumors readers, Lyft has also been updated to support both functions. WhatsApp users meanwhile can now use Siri to dictate and send messages as well as initiate calls. WhatsApp also becomes one of the first third-party apps to make use of CallKit, Apple's new framework that enables VoIP calls to function in iOS 10 like FaceTime and regular cellular calls. VoIP service Viber also supports the feature. After updating the app, incoming WhatsApp calls appear in the lock screen showing the caller's profile picture and the typical call response buttons. In addition, WhatsApp contacts are now integrated into the native Contacts app in iOS 10, and also appear in the Phone app's Favorites. The WhatsApp update includes a number of other enhancements, including the ability to forward multiple chats at once. To enable Siri integration for the apps, users should go to Settings -> Siri -> App Support and toggle the relevant switches to the on position. Users should expect plenty more third-party Siri integrations to appear in the coming months. Siri is going to be useless until I can feel like I don't have to memorize a list of commands in order for her to understand me. This is a step in that direction but still probably not enough. Lyft always get shafted for some reason. This was available with them the day after iOS 10 was realized. I know because I used it. I hope that YouTube (google) start to cooperate with Siri app support, although I know that they have their own voice command embedded in their apps. It would be very cool to ask Siri to show a specific video on YouTube. "Hey Siri, can you ask google now to show me a YouTube video by..."
I'm sorry.... OH? Did you mean HO? Or is that a new shortening for something else? Other half, thought it was a pretty common abbreviation?! Not picking on your comment specifically but I've noticed several "Lyft did it first" type posts. We're four days past iOS 10 release, do we really need to split hairs over who made it through the app store approval process first? I realize Lyft is the underdog here to the 800 lb Uber gorilla but one day faster to app store isn't something I'd be using to differentiate. Perhaps posts would be better served talking about your happiness that Lyft is using Siri integration due to being a fan of the company, it's culture, it's pricing, etc... If you are a big Lyft fan (I'm guessing those who notice a one day difference in app release dates are) then here's a chance to talk about *why* you are so found of their service and I'd bet being a day earlier to Siri integration isn't in your top ten of reasons. Your post reveals the potential problem-- you aren't using Siri enough to realize that you don't have to have a memorized list of commands. You couldn't be more wrong in your impression. I haven't memorized a list, but use the Siri feature everyday and while she still can improve a lot, she has achieved an impressive level of dexterity in responding. For example, if I want to find out if a particular sports team won, I can ask "How did x do?" "Did the x win?" "Who won the X game today?" etc. I can say "Wake me up at 7" or "Set an alarm at 7" or " I need to get up at 7", etc. "Text Ann", "send a message to Ann," "iMessage Ann" etc. For weather, "is it going to rain," "what's the forecast for" "am I going to need an umbrella" what's the weather going to be," etc. There are tons more examples, but you get the point. I really encourage people to give Siri a try as she can really make your life easier, and with iOS10 she is even more powerful. 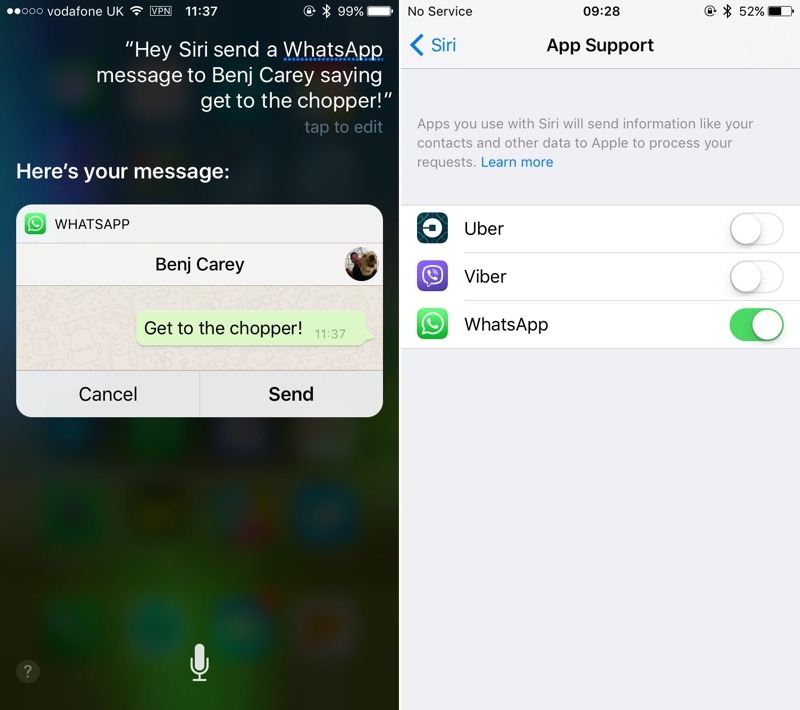 Two of the first apps to make use of the new Siri SDK are WhatsApp and Uber, both of which issued updates for their flagship apps this week. Uber users can now hail a ride with a "Hey, Siri" command, followed by "Book me an Uber" or other variants. Apple has also allowed the ride-hailing service to be integrated into Apple Maps under a new Ride tab, where users can choose from a list of available drivers in the area. WhatsApp also becomes one of the first third-party apps to make use of CallKit, Apple's new framework that enables VoIP calls to function in iOS 10 like FaceTime and regular cellular calls. To enable Siri integration for both apps, users should go to Settings -> Siri -> App Support and toggle the relevant switches to the on position. Users should expect plenty more third-party Siri integrations to appear in the coming months.